You don’t have to be a chiropractor to know that our backbones are some of the most important bones in our bodies. They protect our spinal cord and for most people, they keep us walking straight and tall. For a person with scoliosis, however, the spine can also be the source of a number of challenges. While scoliosis is a common condition, affecting 1 in every 25 people, there is not a lot of awareness about the condition. In recognition of this month being Scoliosis Awareness Month, we are taking this opportunity to shed some light on scoliosis and how chiropractic can provide support and relief to those who have it. Scoliosis is a common spinal deformity in which the spine develops with one or more abnormal curves. While most cases of scoliosis are mild, severe cases can require surgery to prevent the condition from worsening. Depending on how badly the spine is misaligned, symptoms of scoliosis can include uneven posture, pain, reduced flexibility, difficulty breathing, organ damage and in severe cases, death. Anyone can get scoliosis. The most common type of scoliosis, idiopathic scoliosis, generally develops in children and more often in girls than boys. There are a number of factors that can prompt scoliosis to develop, such as neuromuscular conditions, birth defects and old age but there is uncertainty about what causes idiopathic scoliosis. Who can screen for scoliosis? A physician, chiropractor or other healthcare professional can assess whether or not you have scoliosis. There are three main components to scoliosis care; assessment, diagnosis and treatment. Assessment: This is composed of a screening to determine if a patient has scoliosis, and if they do, how severe. A scoliosis screening is a non-invasive physical exam that can take as little as 30 seconds. The healthcare professional examines the patient’s body for any signs of uneven posture or irregular curves in the spine. Diagnosis: Once a scoliosis of the spine is detected, healthcare professionals can begin conversations about ongoing monitoring, and treatment. Ongoing monitoring of scoliosis is a critical component of scoliosis care. Treatment: The primary goal of scoliosis treatment is to maximize the mobility and function of the patient’s body. The abnormal curves associated with scoliosis can cause stresses on weight-bearing joints. This can cause pain throughout the patient’s body, not just the spine. Some examples of treatments include bracing, exercise and chiropractic adjustments. Very severe cases of scoliosis may require surgery to correct the curve. With a condition that causes the backbone to develop abnormally, it begs the question of whether or not chiropractic treatment is safe and effective. Dr. Brian Gushaty, Registrar of the Alberta College and Association of Chiropractors provided the following explanation about how chiropractic can help. How can chiropractic help people with scoliosis? Chiropractors spend over seven years studying how to assess, diagnose, treat and prevent problems of the spine and musculoskeletal (MSK) system (joints, ligaments, tendons, muscles and nerves). This educational background can make them ideal healthcare providers for the management or co-management of conditions like scoliosis. In some cases, the scoliosis can worsen and cause additional challenges to a patient’s quality of life. A chiropractor has the ability to track the progression of the scoliosis, which is especially important in adolescents. Since their bodies are still growing, there is a chance that their scoliosis will become more severe during growth spurts. If this is identified, chiropractors can refer directly to the appropriate medical specialist. Chiropractors regularly work in collaboration with other healthcare professionals. If a chiropractor notices a condition worsening or if their patient requires specialized care, they will refer them to other professionals in the medical community who can provide additional support or optional treatment. Let the chiropractor know that you have scoliosis and any prior treatment you have received. In most cases, the adjustments are nearly identical to what a patient without scoliosis will receive, but special consideration is given to immobilized parts of the spine and weight-bearing joints. Ask about the chiropractor’s approach to treating scoliosis and their relationship with related medical professionals. Asking this question will help you understand what kinds of treatment the chiropractor can offer you and will demonstrate their understanding of scoliosis management. You will also be able to determine whether they have the resources to refer you directly to the appropriate medical specialist if you require specialized treatment. Listen to the chiropractors’ recommendations for care. Recommendations should sound sensible and include specific re-evaluation intervals. 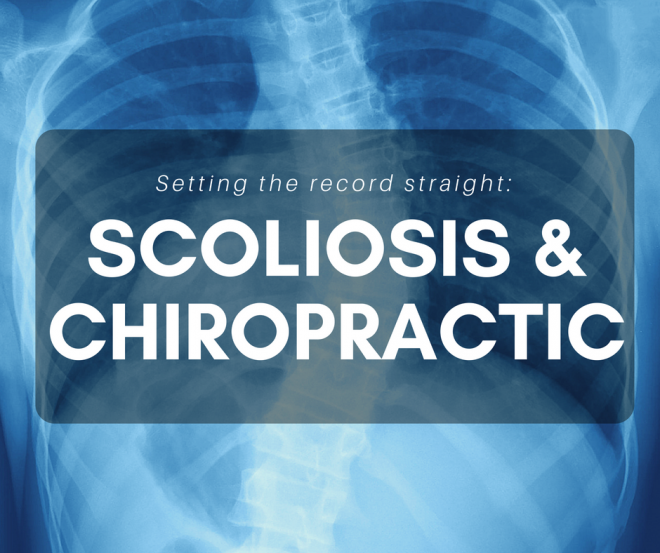 Re-evaluation is important because it will help track whether the scoliosis is progressing. It also helps ascertain whether the patient is gaining function and eased ability to perform daily activities. For more information about how chiropractic can change pain and help people with scoliosis, consult with a chiropractor, or click here to find one near you.